Keng Yong was just an ordinary nerdy student when he was bitten by a radioactive business idea. This incredible incident altered his DNA and gave him ninja powers. Suddenly, Keng Yong found that he was able to collect anyone’s namecard with his super-sticky hands. His reflexes became sharper, enabling him to make Powerpoint presentations three times faster. On top of this, Keng Yong developed a sixth sense called “Startup-sense”, which gives him a tingling feeling when an amazing startup is near. Keng Yong is enrolled in NUS Entreprise’s 6-month iLEAD programme, which involves working in an outstanding start-up company. His “Startup-sense” led him to join Gametize, where ordinary people are empowered to create amazing games. 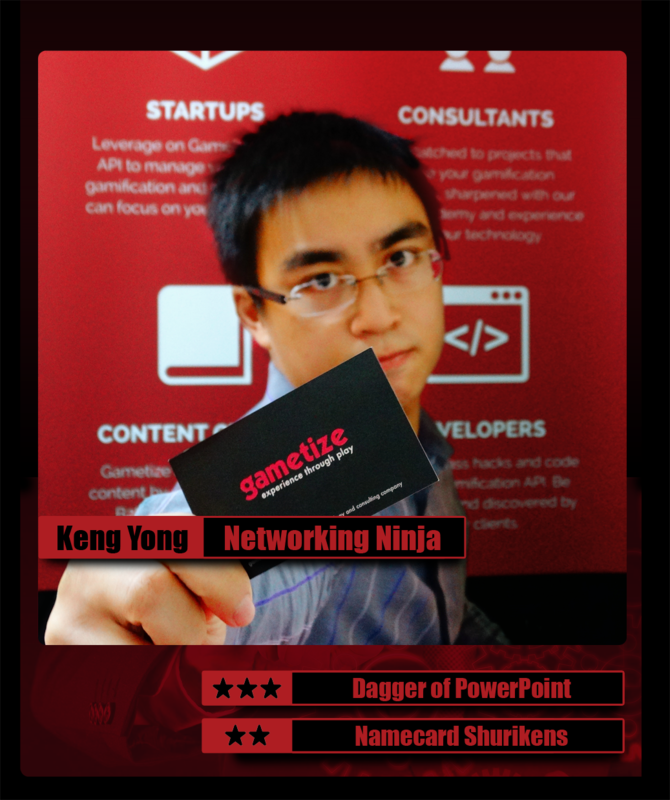 At Gametize, Keng Yong’s powers are strengthened by the high concentration of fun in the office. With his increased power, Keng Yong works hard to create awesome content and find business partners.